We EXPLORED the Letter E with Eddie the Eraser erasing everything and we were extremely entertained with the book, The Enormous Elephant Show! 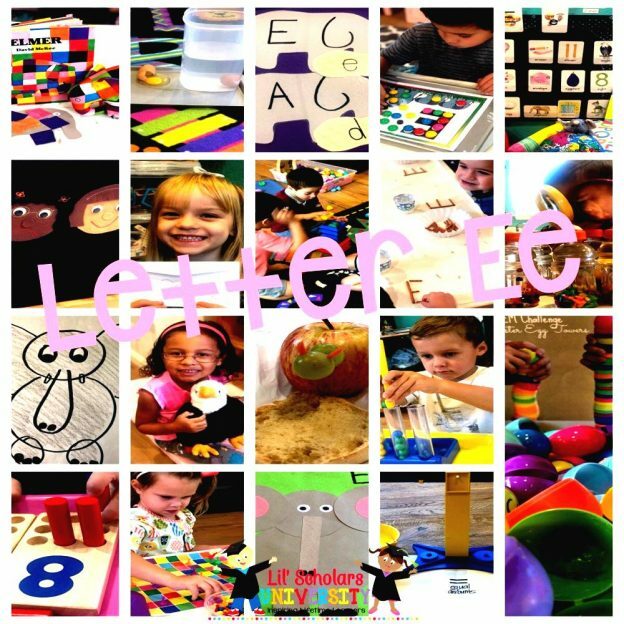 We also engaged with the Letter E and… eagle, earmuffs, earphones, earrings, ears, Earth, earthworms, easel, Easter Bunny, edges, Eeyore, egg, egg STEM, egg rolls, Eggo waffles, eggplant, Eggplant Parmigiana, eight, elbow noodles, elbows, elephant, elf, Elmer, emotions, enchiladas, engine, envelope, equal, eraser, eskimo, eye, eye dropper, 8, 11, and so much more! Extreme excitement today with the Letter E! Look what the Letter E looked like in our room today!!! Everyone exploring the Letter E with eggs (sink/float, spin/not spin, balance, shakers) eggplant, electricity, elephants, exercise and an enormous amount of fun and energy!!! Friday Fun Day with the Letter E! I’m so excited to share my EDITABLE LESSON PLANS with all of you!! I have created my very 1st TPT FREEBIE!! It is a unique Activity Plan that helps organize different centers throughout our themed weeks!! PLEASE let me know your HONEST thoughts, so that I can make any changes that may help or inspire you and your lesson plan needs! !